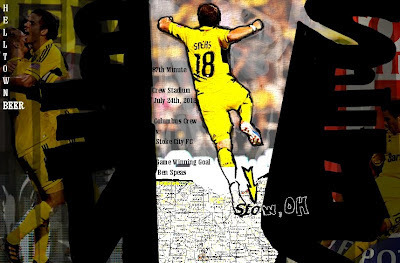 I'll probably do a few illustrations from the Stoke game at Crew Stadium last night. Still trying to process it. The goal Ben Speas had was pretty amazing. Were it a league match it would be a candidate for "goal of the week". Almost 9,000 on hand to watch a friendly. Good stuff. It seems the closer the Crew gets to fielding a side filled with regional players the fuller Crew Stadium gets. It doesn't hurt that those players are playing well either. Talked a bit about Ben Speas at the end of my last post. From what I've seen of him confident that he'll be a good MLS player in the attacking half of the field if given the chance.